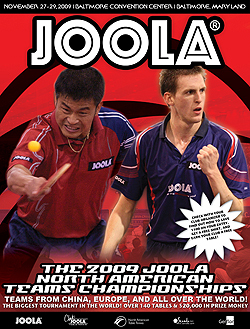 The JOOLA North American Teams Table Tennis Championship is like no other tournament in the world! It’s bigger, better, unique in its format and its atmosphere. First held in 1998, there are nearly 200 players who have never missed the tournament, who have played every year! Why do so many people keep coming back, year-in and year-out? Why did the UK Royal Air Force, which sent one team entry their first year, send six team entries in 2008? We know the answers and share them here! Ask anyone who has attended this tournament; there is nothing else like it! More than 200 teams enter annually, and more than 1,000 players join our event! On 144 tables in a hall of 150,000 square feet, you will spend three days together with them playing in one huge tournament. But unlike other formats, you are not alone against the world. You and your teammates are comrades, coaching and cheering for each other, sharing the highs and the lows in support of your common goal. This is not like playing in your hometown, either! You’ll meet and mingle, compete and confer with people from 5 continents, dozens of countries speaking a multitude of languages, but all united by their love of our sport. Over the three days of competition, you’ll play more matches than at any other tournament you enter this year. Friday, your team plays between 2 and 4 ties against other teams (each tie is the best of 9 matches, each match is the best of 5 games!) in what we call ‘Preliminary Group Play’ or ‘P-Groups’. Friday’s results are used to create ‘Final Divisional Assignments’ for Saturday and Sunday matches. You’ll play an additional 6 to 8 ties over those two days. Every team will have, during the three-day tournament, at least 40 and as many as 108 matches for the members to contest! You will play a lot at the JOOLA North American Teams! Those matches are going to be highly competitive. Once you finish your Friday schedule, Final Division Assignments match your team against the most similar teams in the field. There are highly competitive matches between well-matched peers. Your opponents may be taller or shorter than you, older or younger, the opposite gender, speak or not speak your language, but they will almost all be as good as you are! At the very top of our field, the ‘Elite Division’, you’ll see the tournament’s best players competing for the big cash prizes. We’ve had Olympians, National Champions, world-ranked players and even a World Champion or two out on the floor, playing in the same event you’ll be in. We schedule the Sunday Quarterfinals, Semifinal and Championship matches to give as many of you as possible the chance to become spectators when ‘the best meet the best’ with everything on the line! It’s a great feeling as the bleachers fill and World Class play begins only yards from your seat. Year in and year out, people tell us that they have more fun at the JOOLA North American Teams. There’s more to do, more great matches, more old friends to meet, more new friends to make. And when you leave the playing hall, our excellent tournament hotel and the beautiful, inviting Inner Harbor area of Baltimore await you with restaurants, museums, shops and attractions. Our playing hall is an alcohol-free zone, and security in the hall is excellent. The City of Baltimore is safe and well lit and you are among friends. It’s a great place to bring your spouse, your kids, your parents and your friends, to share a vacation and to be your cheering section. With all these advantages, it’s easy to see why attendance has grown year after year, making this the Biggest Tournament in the World! All participants must be able to show proof of current membership for USATT, or ITTF member association. If not, USATT membership must be purchased. Tournament passes will not be accepted. All USATT and ITTF rules and regulations will be followed. JOOLA tables & net sets will be used with JOOLA orange 40mm three-star balls. Check-in starts Thursday from 4:00 PM to 7:00 PM. On Friday, check-in resumes at 7:30 AM. All teams must check in before being cleared to play. There will also be individual check-in so that each player can pick up their own entry passes. Please create a team name with less than 30 characters. Teams with an average rating over 2400 must select a name that represents a sponsor or place/region of origin. Teams consists of 3-5 players. Each tie will be 5 out of 9 matches except for Division A Semis and Finals. Each match will be 3 out of 5 games to 11. The Tournament Committee reserves the right to change without notice any team names that are deemed inappropriate. Most recent ratings will be used and seeding will be based on average of the top 3 players in a team. The tournament committee reserves the right to use ITTF world rankings to determine the top seeded teams. If your team is eligible for the Women’s, U-18 Boys’ or Girls’, or O-40 Seniors’ divisions, please circle the appropriate team type. The age cut-off date is November 29, 2009 for juniors, December 31, 2009 for seniors. All teams will be placed into one draw and divisional prize money as stated will be given to the team with the highest finish in the tournament for that particular division.. Entries must be postmarked by October 30, 2009. Any late entries will be accepted on a space available basis with a $100 late fee. If an entry is submitted late, please call to confirm that it was received and accepted. There is a $75 penalty for returned checks. NO REFUNDS after October 30, 2009. Teams must be paid in full before start of tournament!